These words were spoken by a 6 year old boy with high functioning Autism. I was doing a formal assessment of his language skills. We had come to the Sentence Recall task where he had only to repeat back what I had said. Results so far had shown his ability to follow spoken directions when pointing to items in pictures, was age appropriate. When asked to repeat spoken sentences he was unable to reproduce any longer than four words. His score fell below the first percentile for age. Imagine how difficult it would be for him to take in spoken information without the help of pictures. 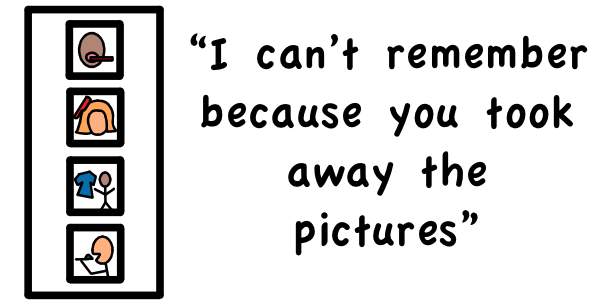 Visuals (or pictures) are a great tool for seeing, understanding and remembering. We all use them – calendars, diaries, lists, Ikea instructions! Visual aids give children the time they need to process what they are being asked to do. They do not disappear into thin air to be forgotten as spoken words or hand gestures do. Visuals can also be sequenced to breakdown and learn a skill bit by bit. Visuals remain the same and allow for identical rehearsal and consistent memory pathways to be created. With this rehearsal and memory of sequenced activities comes learning and understanding, and ultimately increased confidence and self esteem. Visual aids should be used in conjunction with other forms of communication such as speech, signing and tactile experiences. They should be used at home and in the classroom, and not removed because a child “is able to speak / read now”. For more information on how you can help your child or student through the use of visuals, as well as to download free picture resources, visit Visual Aids for Learning.